A federal judge on Wednesday questioned Interior Secretary Ken Salazar's justification for canceling 77 drilling leases sold by the Bush administration around national parks in Utah. A U.S. Justice Department lawyer maintained Salazar had good reason to cancel the leases - and that a lease isn't a lease until Salazar decides to issue one. Until the government decides to release a parcel for leasing, even after an auction, it doesn't have to do it, Tyler Welti argued. Those arguments seemed to leave U.S. District Judge Dee Benson less than satisfied during a two-hour hearing, the first in a lawsuit brought by energy producers over Salazar's February 2009 decision to cancel much of the lease sale held in the final month of President George W. Bush's administration. Benson didn't indicate how he would rule but repeatedly challenged the government to explain how it could get around laws that say the government "shall" lease lands it puts up for auction to the highest bidder. "They could probably fool a lot of people when they say, 'We're having a lease sale,'" Benson said. "'Are you selling leases?' 'Yes, if we decide to.'" 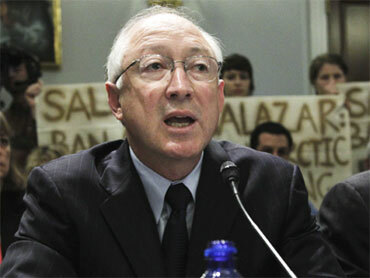 Three Utah counties have joined the suit, alleging Salazar's actions damaged their economies. Salazar has said he voided the leases because they were at the doorstep to Utah's redrock parks - Arches and Canyonlands national parks and Dinosaur National Monument. He also faulted the Bureau of Land Management for failing to consult the National Park Service before leasing the lands, and he questioned whether an environmental analysis justifying the sale was adequate. Welti argued those reasons were good enough for Salazar to scrap the 77 leases. But the energy producers say none of their parcels were closer than 15 miles to a national park. They also say some of the parcels had long been available for leasing and were next to operating oil or gas wells. One of the plaintiffs, Denver-based QEP Resources Inc., said many of the parcels that it won fair and square already had rights of way for roads, transmission lines and pipelines. Attorneys for two smaller players - Denver-based Impact Energy Resources LLC and Peak Royalty Holdings LLC of Heber City - argued Salazar offered no specific reason for deciding any of their parcels was unsuitable for leasing. That makes Salazar's action arbitrary, Denver lawyer Robert S. Thompson said. Uintah County Commissioner Michael McKee criticized Salazar's decision outside the federal courthouse in Salt Lake City. "When these leases were canceled, it sent a message to oil and gas companies. They left our state. So this goes way beyond the 77 leases," McKee said. A Salazar spokeswoman didn't immediately respond to a message left by The Associated Press late Wednesday.